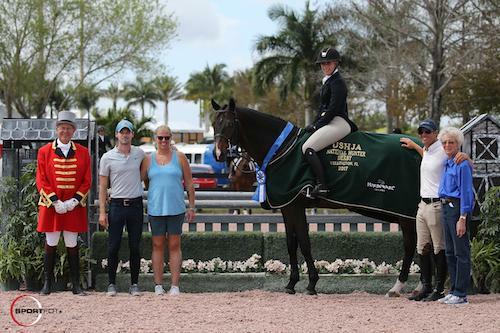 Wellington, FL – February 24, 2017 – Olympic team gold medalist Laura Kraut (USA) was victorious on Friday, February 24, in the $35,000 Illustrated Properties 1.45m speed class riding Nouvelle at the 2017 Winter Equestrian Festival (WEF) in Wellington, FL. 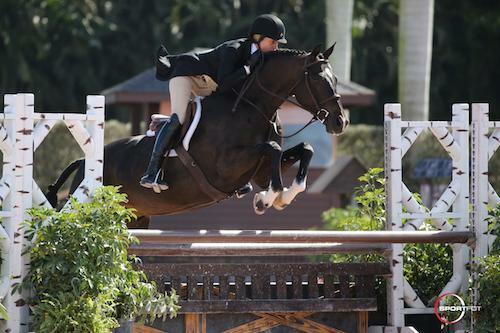 Week seven, sponsored by Suncast®, features CSI 5*/2* competition at the Palm Beach International Equestrian Center (PBIEC) through Sunday, February 26. 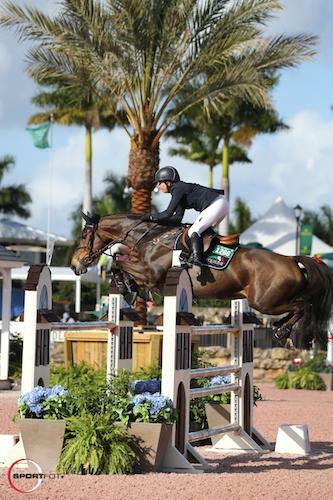 The $380,000 Suncast® Grand Prix CSI 5* is the highlight event on Saturday night, February 25. Live streaming of this week’s events can be found HERE. 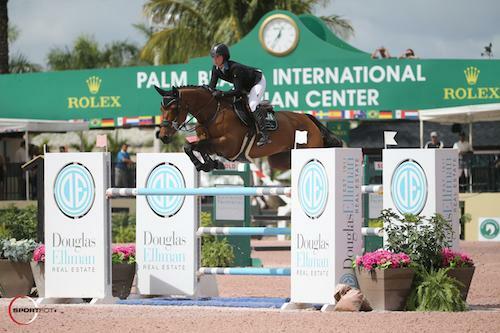 The 12-week WEF circuit continues through April 2, 2017, awarding over $9 million in prize money. Course designer Anthony D’Ambrosio (USA) saw 57 starters over his one-round speed track, with 14 clear rounds. Kraut went early in the order with her first mount, St. Bride’s Farm’s Confu, and set a fast pace in 58.19 seconds that eventually finished third. Several rounds later, Richie Moloney (IRL) stole the lead in 57.17 seconds riding Equinimity LLC’s Ypaja Yando. Moloney’s time held through over 30 rounds, until Kraut returned with her second mount, Nouvelle. Second to last in the order, Kraut and the Evita Group’s Nouvelle took the win in 56.43 seconds, pushing Moloney into second. Feinberg of Illustrated Properties and ringmaster Steve Rector. With a nice win midway through the winter circuit, Nouvelle will continue to jump the next few weeks. “We are being pretty conservative with the horses down here this winter. We have a big year ahead of us, so I will just pick and choose what I think is good and keep her happy and sound,” Kraut concluded. Also competing in the International Arena on Friday, the $35,000 1.45m CSI 2* competition saw victory for Emma Heise (USA) riding Old Willow Farms’ Quentucky Jolly. 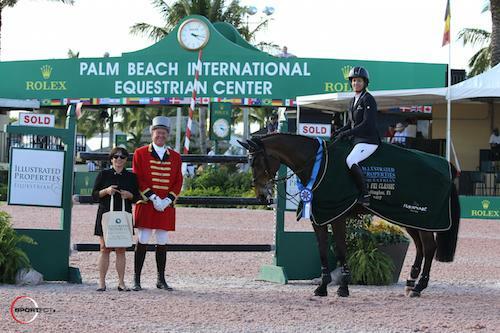 Laura Chapot (USA) won the $6,000 Illustrated Properties 1.40m. Speed Challenge riding her own and Mary Chapot’s Calafornia. The $1,500 Sleepy P Ranch High Junior Jumper Power and Speed concluded the day with a win for Tanner Korotkin and Castlewood Farm’s MacArthur. 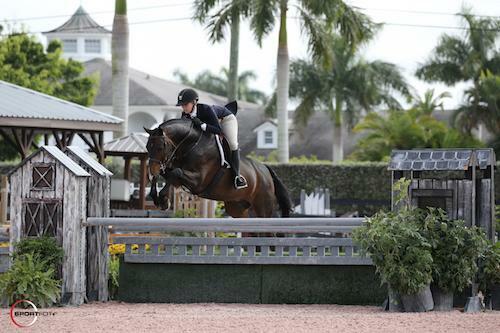 The USHJA National Hunter Derby finished on Friday with Amy Momrow of Wellington, FL, topping the open section aboard Curb Appeal and Nicole Lyvere of Lakewood, CO, winning the junior/amateur section riding Certainty. The open section saw 24 first round competitors, while 27 juniors and amateurs contested for the first place honors. The top twelve scores in the first round of each section returned for a second round handy trip. Momrow has ridden Monty Kelly’s Curb Appeal, a coming seven-year-old Dutch Warmblood gelding by Unaniem, since he was imported in 2014. The pair earned a first round score of 89 and a second round score of 92 for an overall total of 181. Curb Appeal was also presented with the Champion Equine Insurance Hunter Style Award by Laura Fetterman. Lyvere piloted her own Certainty to scores of 90 in the first round and an 89 in the second round for an overall total of 179. Lyvere rides the eight-year-old Oldenburg gelding by Hoftanz in the Amateur-Owner Hunters, and the pair has been partnered together since 2014. Josh Dolan, mother Heidi Bishop, trainer Alex Granato, and grandmother Annette Bishop. The Adult Amateur Hunter 18-35 Section A division awarded championship honors to Cathleen Driscoll of Wellington, FL, and Good Times. The pair won two over fences classes, placed second in another, and second under saddle. 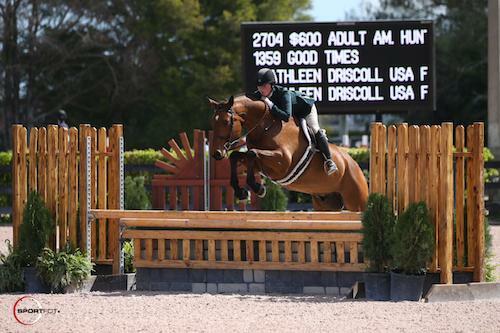 Driscoll enjoys working with young horses and has worked with Good Times since he was a three-year-old. Jef Lauwers of Magnolia, TX, rode Cupid, owned by Lindsay Holstead, to secure the reserve ribbon. Lauwers guided the 2009 Holsteiner gelding to first, second, third, and fifth place finishes over fences, as well as third place under saddle. Week seven of the 2017 Winter Equestrian Festival continues on Saturday, featuring the $380,000 Suncast® Grand Prix CSI 5* in the International Arena in the evening. The THIS Children’s Medal 14 & Under will award a winner in the South Ring in the morning. For full results, please visit www.PBIEC.com. Photo Credit: Photos © Sportfot.